At one point I wanted to write a pizza recipe book and then it turned into a VEGAN pizza recipe book... maybe it's still to come. In the meantime here are some easy, delicious recipes to hold you over. You will need 2 Pizza Doughs. My favorite to make homemade is this one-(I would put honey instead of brown sugar which is not vegan) , but you can substitute maple syrup or coconut palm nectar/sugar for the brown sugar or honey. Also note that recipe is for 1 dough so you will definitely want to at least double it. Roll dough out thinly on a floured surface and place on oiled sheet pan or parchment lined sheet pan. Give a drizzle of oil and sprinkle of salt (if desired) and poke the dough all over with a fork to avoid it bubbling up during baking. Bake at 375 for 10-15 minutes check on it and flip halfway thru. Crank the oven up to 425. If starting with canned jackfruit, drain from the can and rinse then mix with your favorite BBQ sauce to coat. Spread BBQ sauce base on cooked pizza dough and sprinkle with garlic. Add vegan cheese and top with BBQ jackfruit and red onion. Bake at 425 for 10 minutes or until vegan cheese has melted. Allow to cool for a few minutes and top with avocado slices and serve. See video at the end of the post. Slice and cook sweet onions with oil until caramelized. Mix tomato paste with 4 minced garlic cloves, 1-2 Tablespoons EVOO and salt to taste. (If you have basil garlic dip you can mix the tomato paste with 1-2 Tablespoons of that and season with a touch of salt.) Spread the tomato paste base mixture on your cooked pizza. Add more garlic!! Drizzle with caramelized onions and dollops of garlic basil dip. Cook for 10 minutes at 425. Let cool and then garnish with fresh basil. 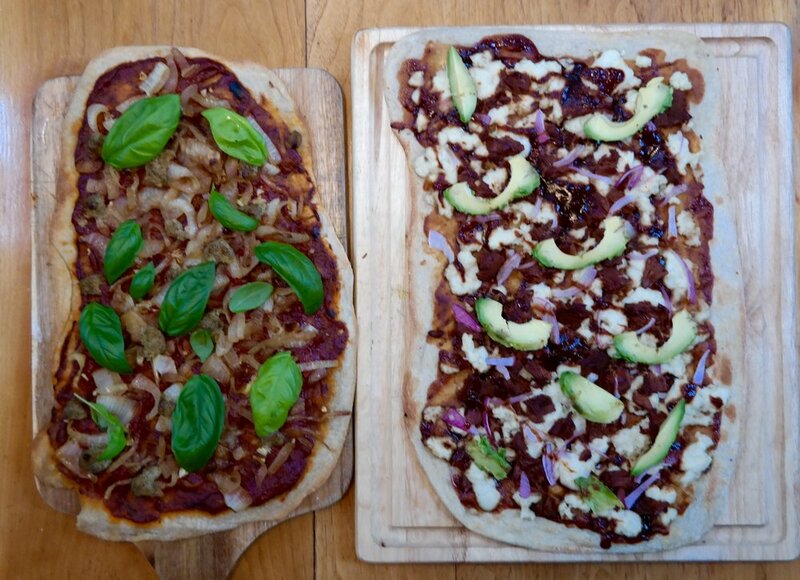 What are your favorite Vegan Pizza toppings? I am all about those veggies!